The Wat Mongkolratanaram of Florida (or as I like to call it the Thai Temple in Tampa) has to be one of my favorite places in Tampa. 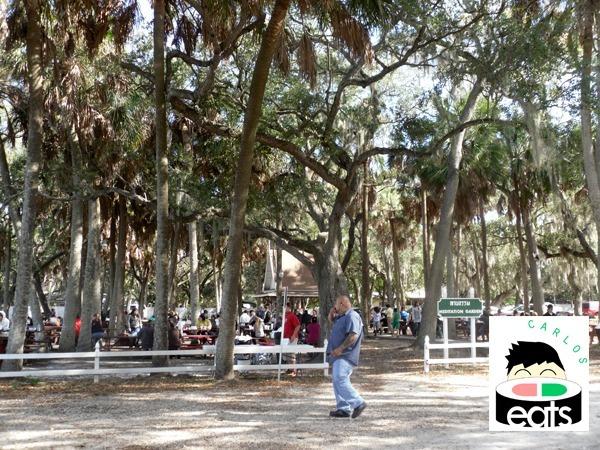 Located right by Palm River, the temple grounds are simply beautiful with tall trees, picnic tables, a dock, and a golden Buddhist temple. 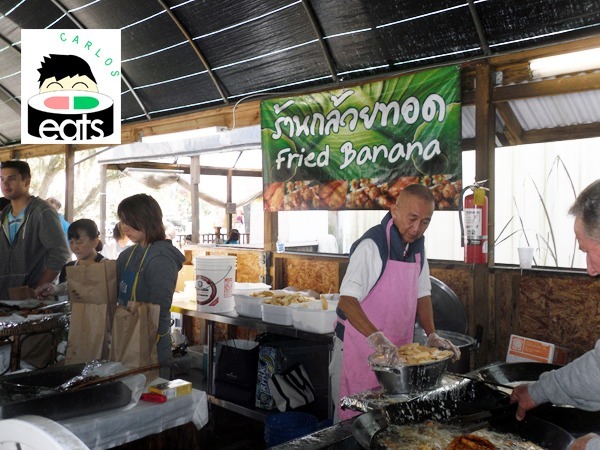 Every Sunday they have a market where they sell Thai groceries, Thai teas/juices, and Thai food such as pad thai, curry, friend bananas, and various desserts. 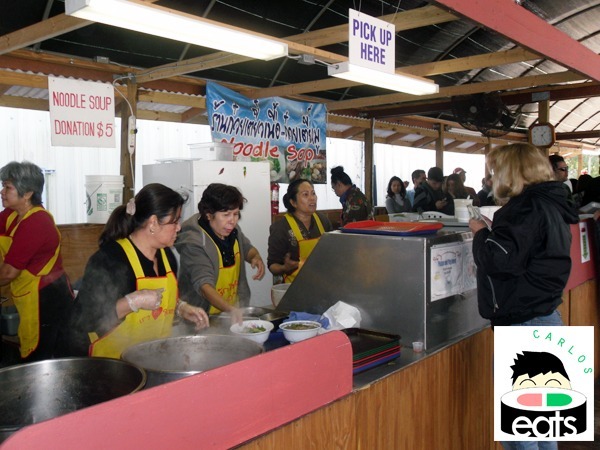 The grounds have a community feel with temple volunteers running stands and locals visiting every Sunday for their dosage of cheap and tasty Thai food. I have been visiting the temple for about 5 years now. 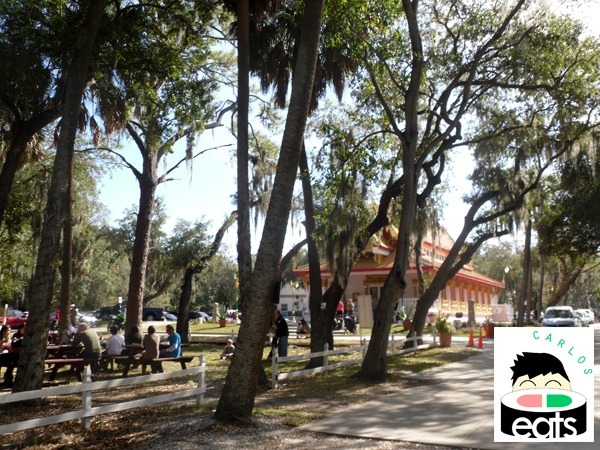 When I first visited the place was mostly just for Thai visitors, but has now exploded in popularity after some newspaper articles exposed this Tampa gem. The temple grounds have had to expand in parking and stands to handle the rush of visitors, but it’s still a beautiful and relaxing spot to spend a Sunday morning and afternoon. 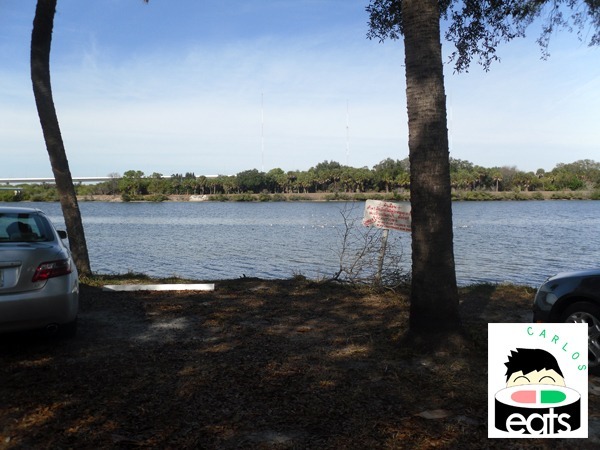 It’s located right between Tampa and Brandon, so not far from either side of town. 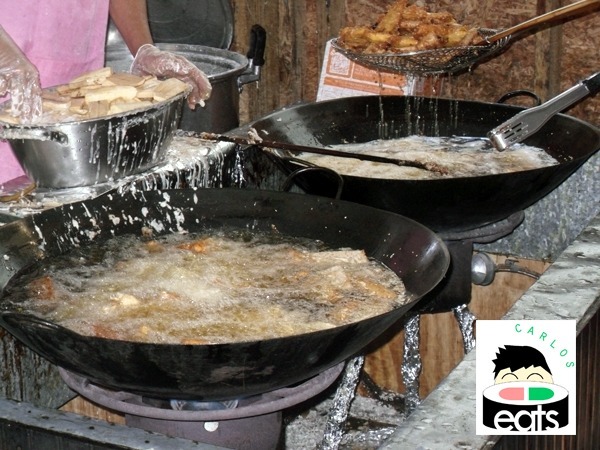 One of my favorite stands has fried bananas. I cannot resist these. A small amount is $3 and is plenty to get your fix. 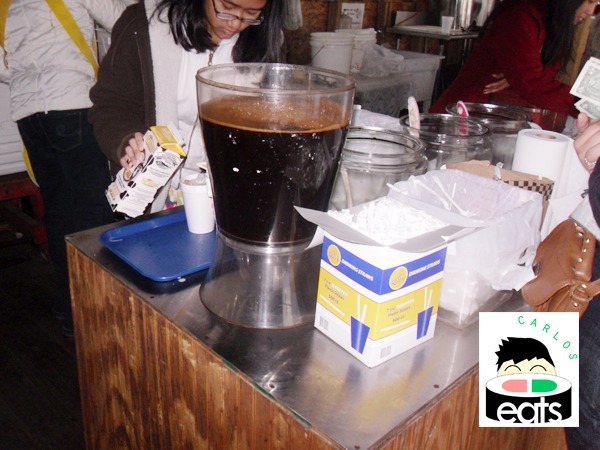 They also have a variety of other choices such as taro root and sweet potatoes, but banana is my favorite. They are put in deep batter. Not sure how healthy it is, but hey it makes it taste good! Voila! 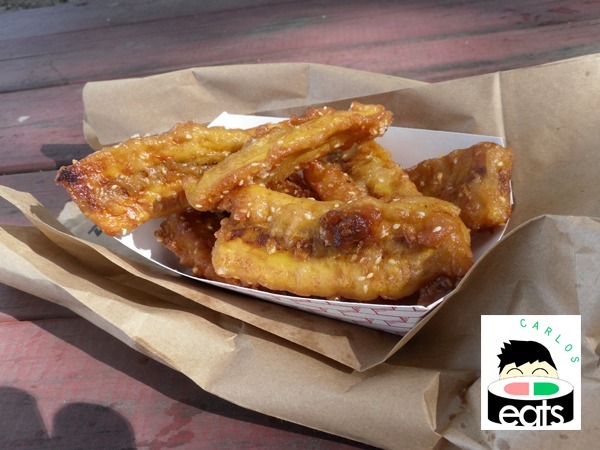 Crunchy fried banana goodness! Their noodle soups are appetizing and my friend used to give me some all the time when I volunteered at the temple back in 2006. I am not a big soup drinker so I spend my money on sweets nowadays. The patio area is full of red picnic tables where you can enjoy your Thai food and hangout with friends and family. The trees are all around. There aren’t many outdoor areas like this in Tampa where you can grab your food and enjoy it outdoors. 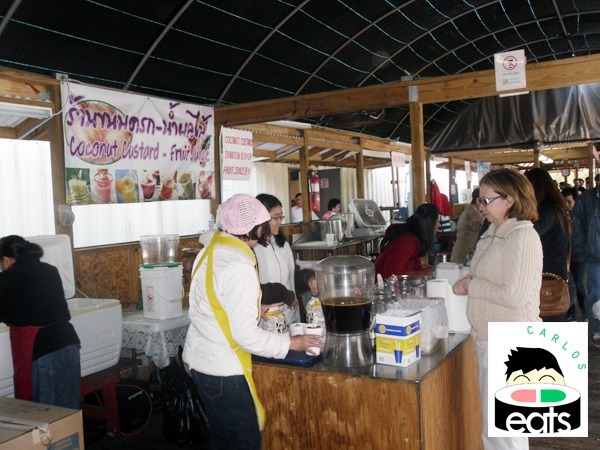 My favorite stand where they serve Thai Tea and Fruit Juices ($1 donations are awesome!) and also occasionally serve my favorite Thai dessert, Kanom Krok (coconut custards). 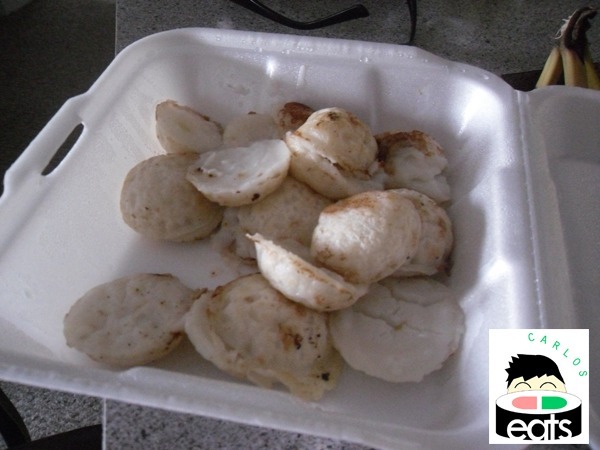 The wait for the Kanom Krok has gone to hours and I waited a good two hours for mine, but it was worth it. I love it that much. They don’t serve it every weekend, but when they do and I’m there I make it my mission to have some. $1 Thai Tea? I’ll take 10 please! 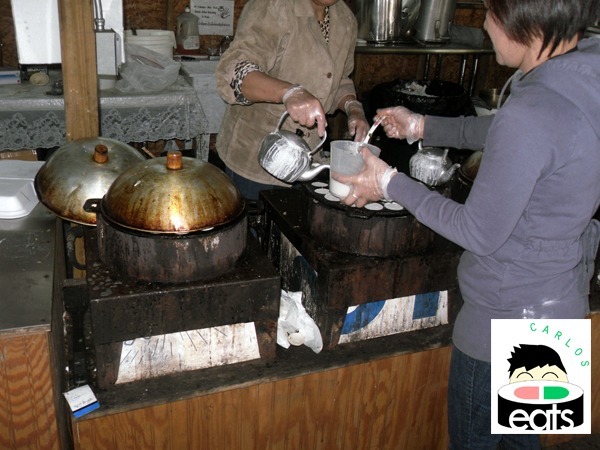 The process of making the Kanom Krok. They use a special pot that takes about 20 minutes to cook. The orders pile up and increase the wait times, so get there early for yours! My beautiful coconut custards (some missing due to immediate consumption). Totally worth the wait. 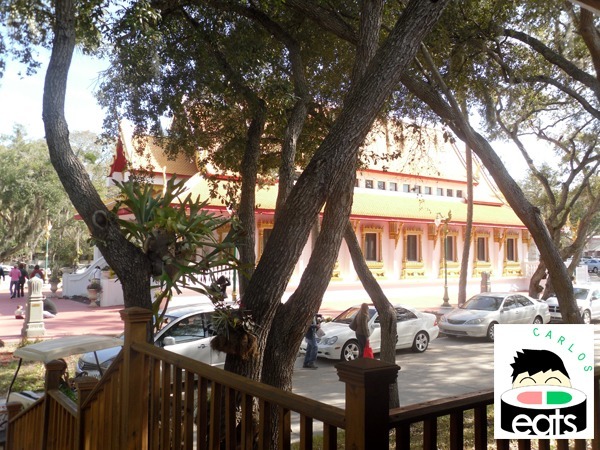 The Thai Temple in Tampa has a number of events throughout the year to celebrate Thai or religious holidays and invites the public out to these events. My favorite was their Songkarn or Water festival, which I checked out last spring. It was lots of fun, especially the water fight with the little kids and various adults. This temple is truly a great addition to the city of Tampa. I’m happy to see they still have the coconut balls. The last two times I’ve been there they haven’t had them and I feared they were gone forever. i’ve always heard such great things about this market. i’ll have to stop by one of these days. What a delicious tour of a wonderful gathering. This post makes me so happy, and think how many people will experience the delights of your pix or make a visit to this sacred and happy place, because of you, Carlos! So glad I found you thanks to the modern spirit-magic connection known as ‘twitter’!